Your motorcycle gear can protect you from a lot of things, but it definitely can’t protect you from stupid. Or guns, it definitely can’t protect you from guns either. MotoVlogger Subliminal Moto was out for a ride with his friends when they noticed the driver of the red truck appeared agitated and was taking pictures of their license plates. So the motorcyclists returned the favor and took a picture of the truck’s plate. The driver then began driving next to the group of motorcyclists while flipping them off out the window. When they came to a stop, Sumbliminal Moto pulled up next to the passenger side to try and see what had upset the truck. What happened next is my worst nightmare. 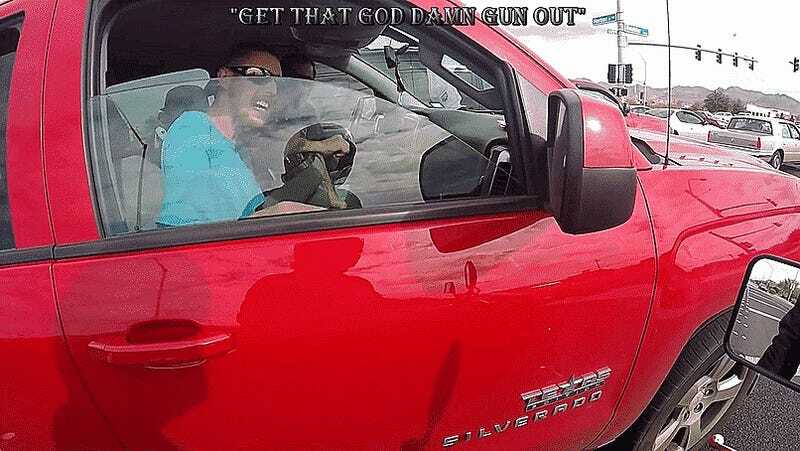 The driver of the truck, likely startled by the armor-clad rider, took things to a whole new level and pulled a gun and threatened to shoot the riders. You know how I’m always ranting (whining) about how we should maybe police ourselves a bit so the world doesn’t hate us? This is why. I’m all for having a good time on a bike (whether within the bounds of the law or not), but there’s a time and place for everything. Now, I know what you’re thinking. A pack of supermotos probably did something super obnoxious and maybe deserved a little bit of a negative response. I spent some time watching the rest of Subliminal Moto’s videos and, for the most part, he is not one of those guys. Added 2/1/2016 10:00 pm: Footage from one of the other guys on the ride, showing that the group didn’t notice the truck until they came to a stop at the light when the driver pulled the gun. For the most part, they’re all just a guy or friends goofing off harmlessly or being funny, and the one video of some drag racing is on a desolate street. These aren’t exactly 12 o’clock boys, although he does admit one of the riders rode in the dirt a little bit. If you think someone in one of those cage things is mad at you, don’t piss them off and don’t pull up to their window to try and sort it out. It never ends well.